Cappadocia: ― a well-known name from the New Testament and later from early Church history. It was this famous province which became the cradle of the mighty men known as Cappadocian fathers: Basil the Great (ca. 329-372), bishop-theologian-teacher and ascetic. Gregory of Nyssa (330-ca.395) was younger brother of Basil, known as Father of Fathers. Gregory of Nazianzus (330-ca.389), with outstanding power of oratory. Macrina (328-379), was younger sister of Basil and Gregory of Nyssa, theologian and philanthropist. Eusebius Pamphili (ca.265-ca.339), eminent Church historian, likewise had his origin in Cappadocia. The chief city of this renowned land was Caesarea Mazaca. It became home of Gregory the Illuminator (ca.240-332), known as Apostle of Armenia. It was in Caesarea that Gregory was converted to Christianity, eventually ordained and dedicated as bishop (catholicos). He proceeded to Armenia and introduced the faith of Christ to King Tiridates, bringing him and the whole Armenian nation to Jesus Christ (ca.302). South of Caesarea is the prominent Göreme (Koramos) with the striking chimneys of different heights and shape, rising throughout the eroded volcanic territory. The numerous tuffs were conveniently utilized by the Church to hollow and construct churches in most of them. A number were also made into homes, being occupied until this very day. This area is undoubtedly Turkey’s number one touristic site. Such an illustrious city was Caesarea which carried a strong Christian tradition until World War I. During this bloody conflict the notorious Armenian massacre also touched Kayseri, along with many other cities and towns in Asia Minor. Today Kayseri is one of the staunchest Islamic cities in Turkey with a population of over a million. The present-day emphasis is to make this city a center of industrial enterprise with Muslim acclimatization, curiously emulating the practical aspects of Calvinism. During the rise of the Ottoman Empire in 1381 Caesarea was captured along with the surrounding territories. At the time, the population consisted almost exclusively of Armenians and Greeks. Naturally the Ottomans started settling their own people in the area, but still the two ethnic elements were in the majority, being allowed relative freedom by the conquering power. They had freedom to exercise the tenets of their faith and run their schools. Following the Ottoman occupation the famous Cappadocian monasteries started being eclipsed. The whole picture changed during WWI when the Christian population was practically decimated. The nearby ravishing city of Talas (Moutalaski), elevated above the Caesarean plateau, was distinguished by the attractive vineyard terraces in the shadow of Mt. Erjiyes (Argios), the highest mountain of Central Anatolia (3916 m). 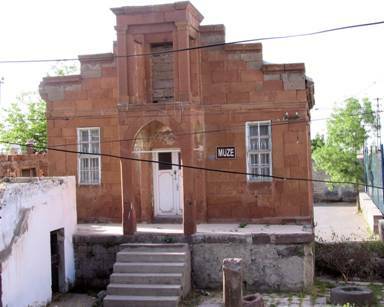 Talas became home of an American academy which functioned until the 1970’s. It was run by the American Board of Commissioners for Foreign Missions. It trained many worthy Armenians and Greeks, a number of whom went into the ministry of the Gospel. The Board also ran a hospital in Talas. At the inception of the Turkish Republic in 1923, the helm of the country was taken over by Kemal Ataturk (1880-1938) who forbade the teaching of any religious subject in Turkish schools, or by the still-existing missionary schools. We will suffice with this cursory geographic-historic-demographic background of Cappadocia and Caesarea, the capital city. We shall go on with the story which constitutes the topic of this record. Most of the information is taken from the account, ‘Glimpses from the Life of Stephanos I. Sirinides (revised)’, printed in Greek and English by Sophocles Sirinides (Sery), son of Stephan Efendi (1846-1916). Stephanos I. Sirinides, known as ‘Stephan Efendi’ (Mr. Stephan), born in Talas, was the oldest of four children in the household of Ioachim and Maria Sirinides. He was given that beautiful Greek name which means ‘crown’. Father Ioachim was a dyer by trade, quite a common occupation in Anatolia, but not widely popular in Talas. Like so many other Greeks and Armenians in Cappadocia he had to look for greener pastures. His search led him some one hundred fifty kilometers south of Talas to Karaman where he started the same business. The shop kept him from returning home except for once a year. On one occasion it was two years. Stephanos worked with his father who was his mentor and partner. But on one of the trips to Karaman father Ioachim succumbed to illness, so the burden of the whole business fell on Stephanos, who at the time was only sixteen. He was left with the responsibility of supporting his mother, two brothers and a sister back in Talas. This went on for four years. At the age of twenty he married his childhood fiancée, Sophia Onasoglu, having been engaged to her by the family at the age of ten. Sophia was only fifteen at the time. Parenthetically, we will mention here that Sophia was a cousin of Aristotelis Onassis, whose father Socrates left this area at a young age and moved to Izmir (Smyrna) for business enterprise. He changed his name from Onasoglu to Onassis. The famous ship tycoon was born in Izmir. At the end of World War I he migrated to Argentina where he built a maritime empire. The marriage brought an end to the work in Karaman. He was immediately obliged to return to his own city where he started a dyeing business. More importantly, it was here that he became the progenitor of a very large family. Stephanos was a young fellow attached to his Greek Orthodox Church where he was a psaltis—chanter, on one of the two sides of the nave. Much work fell on the psaltis, including reading of Scriptures. Because of his expertise in Byzantine music he was greatly admired in the community. Eventually the parish offered him the possibility of leaving his trade and become priest in the church. The custom in the Orthodox Church was for the candidate to obtain his wife’s approval, an intelligent arrangement toward harmonious involvement in ecclesiastical ministry. It was a modern idea for that time and especially in a distant town like Zinjidere. Sophia did not like the idea of being wife of a priest so that settled it. Stephanos refused the offer and carried on with his business. However, he did continue to serve as psaltis. His choice to continue serving the church was very beneficial because he began reading God’s Word, a practice uncommon to the Greeks. He diligently studied the Scriptures in the original Greek, and the Holy Spirit began his work in Stephanos’ heart. He started realizing the variance between the living and quickening Word on one hand and the ordinary chanting of liturgical singing on the other. The Greeks in Anatolia could hardly read the Scriptures in their own language, since they spoke Turkish at home and in the marketplace. Stephanos had gone to school until he was thirteen, after which he joined his father in the old trade. Following this refusal of the office of priesthood he took an increasing interest in reading the Scriptures in his own language. This was the venue of a brilliant future. God’s time arrived when he laid his hands on a Turkish New Testament written with Greek characters. This worthy production was the fruit of the British and Foreign Bible Society, with the American missionaries’ full assistance. The Congregational missionaries from New England entered Asia Minor in 1821. One of their first undertakings was to render the Scriptures into Turkish with Greek letters for the Greeks and with the Armenian alphabet for the Armenians. They also produced it in Turkish with the Arabic script, in order to make the Word available to Muslims. Reading the New Testament opened an amazing horizon to Stephan Efendi, as he had already become known. He started sharing God’s message with his fellow-Greeks in Talas. It wasn’t long before his shop was converted into a stopping place for the many people who wanted to learn the teaching of the Bible from his convincing words. Stephanos’ effective witness to his neighbors and other shopkeepers went on for quite a while. At last the priest of the town became aware that something different was going on in the shop. This disturbed him. Stephanos was getting involved in an unaccustomed thrust which the priest himself did not do, and probably couldn’t do! An accusation was leveled against him ― he was teaching heretical views. An incrimination of this sort was very serious. The priest and his colleagues never pointed out what the nature of the heresy was. He was simply accused of being a heretic and was called to recant his teaching. But Stephanos was already astute in the faith and knowledge of the Scriptures. He wasn’t going to budge. Following a series of insistent requests they realized that Stephanos had gone too far in expounding New Testament teaching. This was not in keeping with the long-established tradition of the Greek Orthodox Church. It didn’t take long for them to excommunicate him. They forbade the Greek people to sit down with him and discuss matters of the faith. Not satisfied with this, they pressured the owner of the shop where Stephanos had his business to terminate the lease and put him out. One day some trouble-causers entered the shop and broke all the earthen pots which he used to dye the items brought to him by customers. It was a shameful act. After breaking everything with hammer and chisels, they threw the whole mess out onto the street. The warfare grew in intensity. The priest and his colleagues approached Stephanos’ family commanding that they disown him. But his wife and his brother Prodromos, who was helping him in the shop, firmly resisted. Later Prodromos remarked, “This attack was a blessing in disguise because we could replace the containers of clay with those made of brass. We were freed from the frequent breaking of earthen pots.” Stephanos had to vacate his shop and move elsewhere. His new shop was not too distant from the old one. It was the property of the one of the church members who chose not to succumb to the pressure of the priest and his supporters.